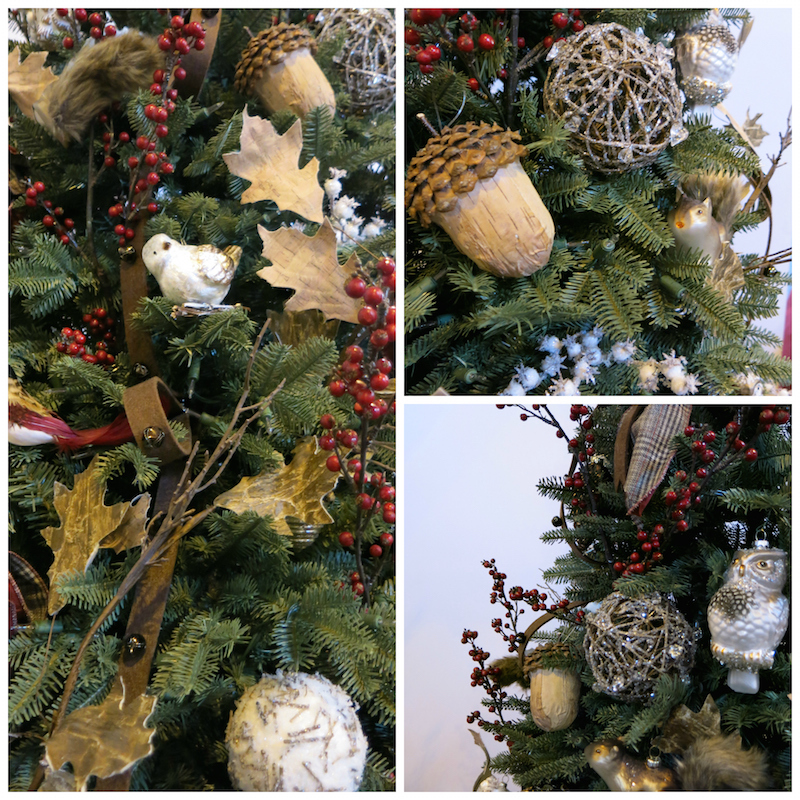 For the bulk of the ornaments, I wanted to include earthy elements and pieces that communicate both the frozen hues of a winter forest and the life that persists through every season. 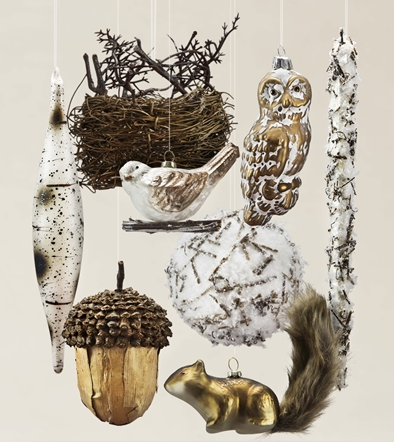 The Woodland Ornament Set from Balsam Hill features an ideal selection of frosted acorns, bird’s nests, owls, and twigs. Each piece has a rustic touch reminiscent of the quiet countryside. 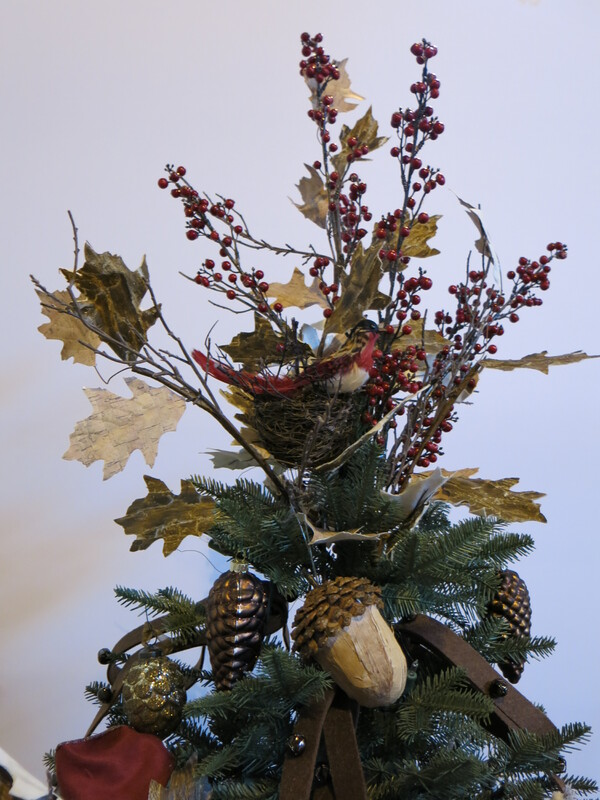 The best tree topper for a woodland themed Christmas tree is something made of natural elements. The red berry sprays and leaf picks I’ve selected are a perfect balance of organic shapes mixed with standout colors that highlight the vibrancy of the woods. These are simple to create a topper from; just insert the picks at the crown of the tree, making sure 8 inches of the sprays are sticking out from the tip. Alternate the position of the leaves and berries and make sure the placement is roughly symmetrical. For a luxurious look, slightly fan the sprays and picks so that they extend outwards from the top of the tree. Then, insert the bird’s nest from the Woodland Ornament Kit at the side of the tree facing the front. Add in the bird from the Manor Robin Set as a finishing touch. 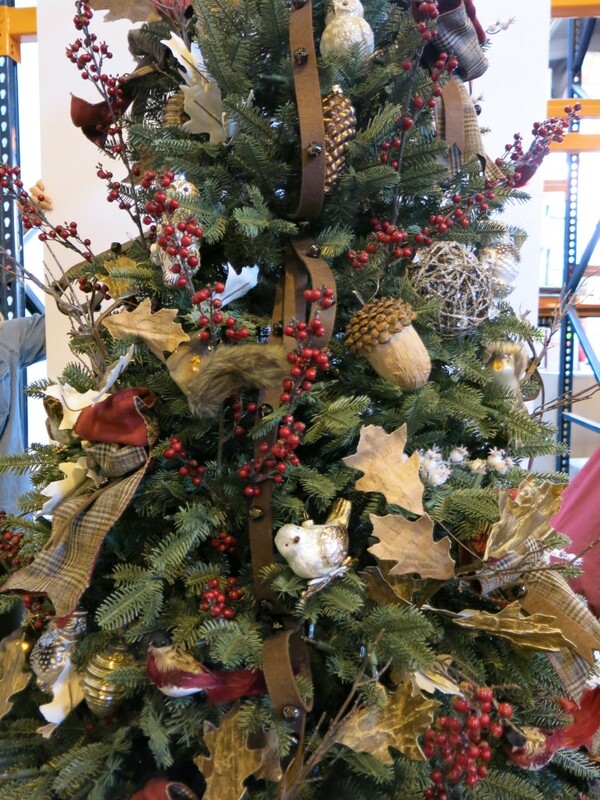 Balsam Hill’s Jingle Bell Felted Ribbon is the perfect adornment for this tree because of its earthy brown color. 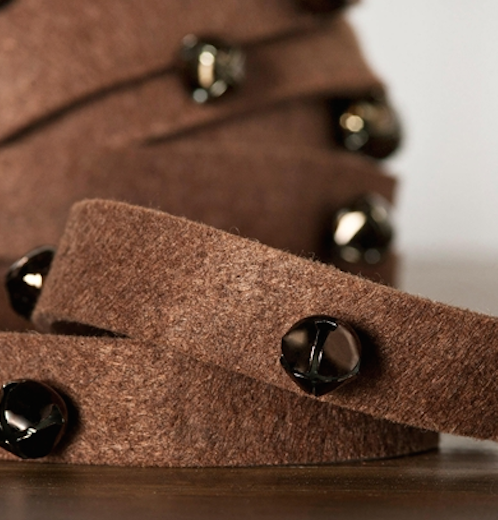 Use five rolls of this ribbon to create the vertical garland. Count the jingle bells on the ribbon to measure the length of each loop. 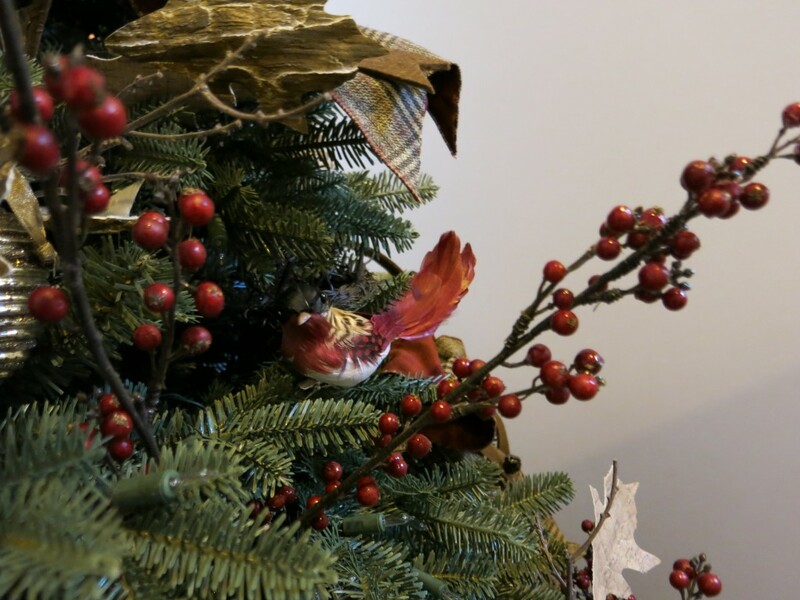 Start at the top by attaching the tip of the ribbon with floral wire onto the tree. Measure up to five bells, before looping the ribbon and cinching it with wire. Work toward the bottom. You can have an interval of six bells at the bottom for a larger loop. Create ribbon ties with the Brown Glen Plaid Ribbon and hang each tie on the spaces between the cinches on the vertical garland. Plan the layout before hanging the ornaments. Count how many pieces you have of each unique design and make sure that they are distributed evenly throughout the tree. Hang several of the ornaments in each section in a staggered manner, in such a way that the ornaments are not repeated often, or that similar pieces are not next to each other. When you have finished hanging all the ornaments, add a finishing touch by filling in blank spaces with berry picks, snow berries, and oak leaves. Take a step back and adjust as necessary to give it a full, but balanced look. 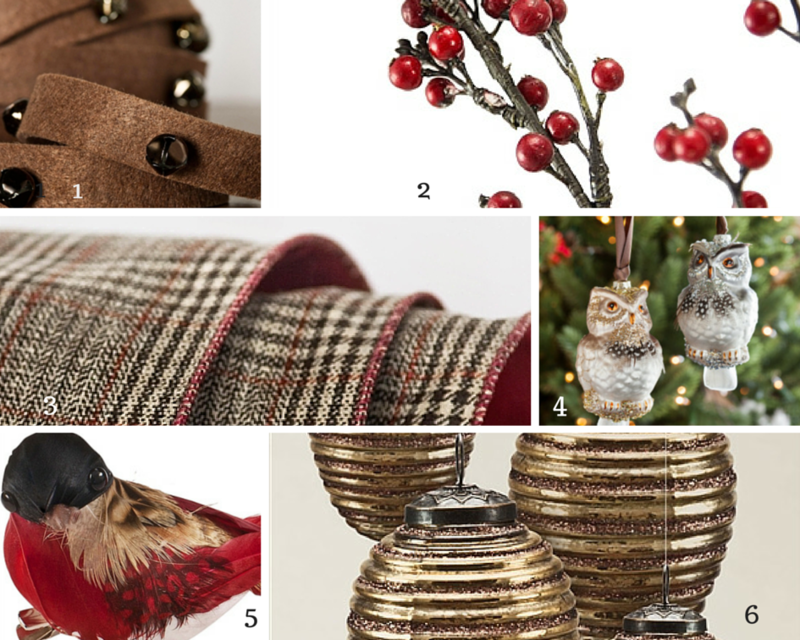 You can add some more ornaments that have the same rustic charm and fit the theme too. When you’re done creating your woodland themed Christmas tree, you can now enjoy the relaxing view brought by your nature-inspired display.